In the skies above Northern China, a Soviet plane containing a contingent coming to intercept the minerals coveted by the Japanese and the Americans is promptly shot down by order of Major Kondo. His superior congratulates him on how his information seems to have diverted or killed most of the other potential interested parties in this matter. Amusingly, yes, Imperial Japan DID have interest in building am atomic-powered death ray at some point in the 1930s, as did the British... though in the latter case, it was really more of a cover to hide the fact that they'd built something overall more practical: radar. 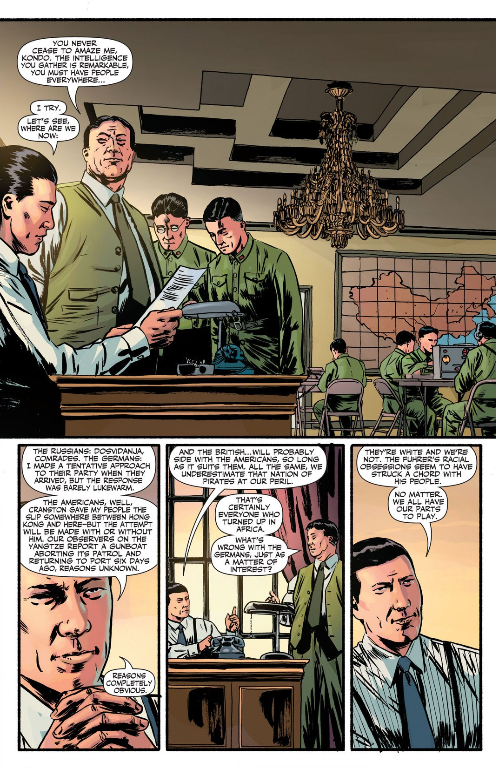 Elsewhere in Shanghai, Lamont Cranston meets up with the newly arrived Pat Finnegan and a US marine officer who'll be overseeing their protection on the mission. The Marine captain says that his team's been ready to head up stream for days now, but Lamont had apparently insisted that they wait for Finnegan first, a fact that the secret agent agrees with. After all, he says, he's the one in charge. Since they're all together, Lamont fills them in. It seems that Wong, a warlord that he and Kondo knew from the bad old days, has approached numerous governments with the intention of selling his stock pile of radioactive ore (that's what the search was for) to whatever party pays the most. And since Kondo and Wong made each both a ton of money back in the 1920s, chances are the Japanese look to be a shoe-in in this deal. Cranston says that Kondo's genius lies in his use of informers, which is why for the past few days Lamont's deliberately maintained a low profile. 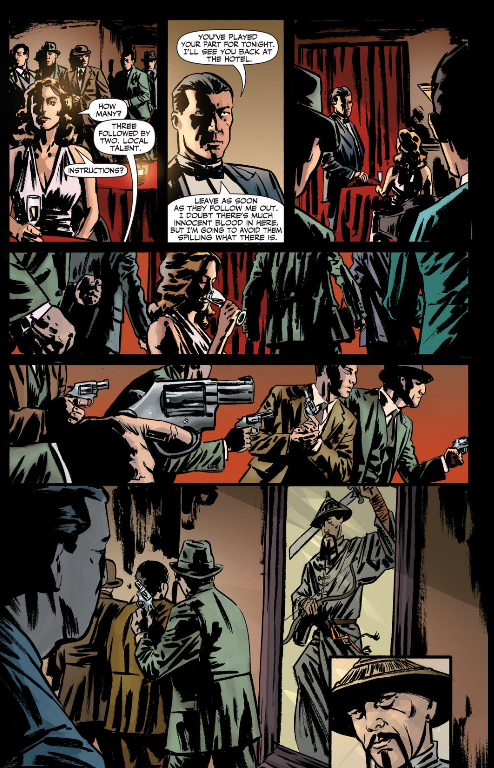 Now Finnegan is here, Lamont deliberately arranged for them to meet as publically as possible so that news would reach Kondo, who would then send assassins after them. Since it's unlikely that Kondo will come in person, Lamont will then question the assassins for his whereabouts, and then kill him himself. The US team then can leave tomorrow morning to go and get the minerals themselves, as without Kondo the Japanese mission should just disintegrate. Finnegan is somewhat annoyed that Cranston has come up with a complete plan of action without running it by him first, after all Pat is the one who is meant to be in charge as he points out. The marine asks what exactly is it that he wants them to do then... and with no options, Pat says to just do what Cranston already had planned. 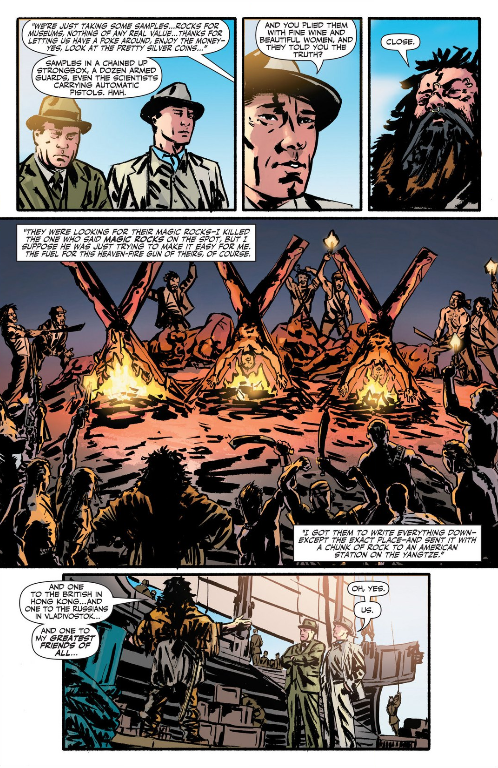 Elsewhere, General Akamatsu and Major Kondo meet up with Wong, aka Buffalo, who tells them how he came across the macguffin rocks. Later, Margot and Cranston are very publically having dinner in a fancy nightclub as they lie in wait for the upcoming assassination attempt. 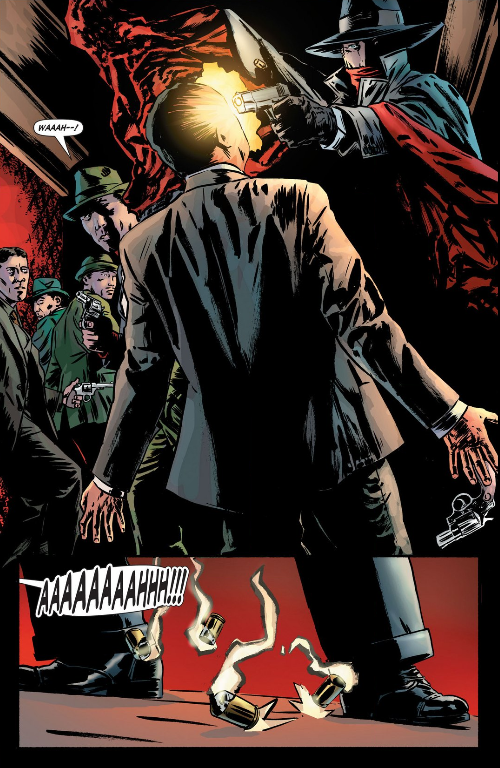 Following up on the information gathered from the corpse, the Shadow leaps into the building he was told Kondo would be, and promptly tommyguns everyone inside. 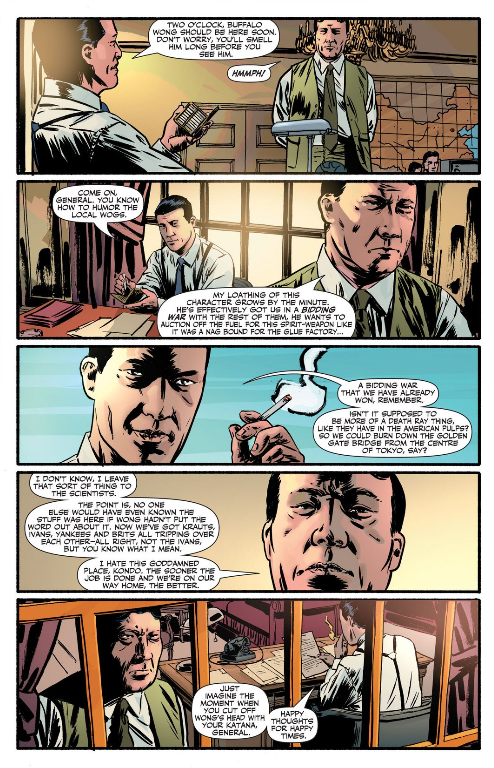 Enough of the assembled secret agents inside are able to briefly get off a couple of words in German before they died, making the Shadow realise that rather than personally send assassins after him, Kondo tipped off the Nazis instead.